BamaHoops: Mess with the Bull, get the (long)Horns, Texas 66 Alabama 50. Mess with the Bull, get the (long)Horns, Texas 66 Alabama 50. This national embarrassment is 100% on Avery Johnson. Shaka Smart coached circles around him, and Texas got a blow out win on the road despite playing without their leading scorer. Texas controlled the game from the tip. We made a few runs, cut it to 7 at halftime and I kept expecting us to make a run to get back in the game, but every time we cut it to 5 or so the defense would fall asleep and give up a couple of wide open 3s. We knew it would be difficult to score in the paint with Mamba down there, and he lived up to the hype, finishing with a double-double 17 points and 11 rebounds. Our shooting slump continued, as we only made 3 of 15 from beyond the arc, and 5 of 9 at the free throw line. I thought we should have used the dribble drive to at least try to get their bigs into foul trouble. Sexton was a little too unselfish in my opinion, he seemed to be looking to pass first. I thought Donta did a decent job defensively on Mamba early, but he got into foul trouble and wasn't the same when he came back in the game. Giddens played well, scoring 10 points in 21 minutes. Petty scored 14 in his return to the arena where he won multiple state championships in high school. We mostly played a zone defense in the second half which allowed Texas to control the tempo. We were never going to beat them in a half court game and I was disappointed we didn't try to run more. Ultimately, the main reason we lost this game in pathetic fashion was Avery's nonsensical substitution patterns. I really don't even know where to start here. I suppose he was rewarding Alex Reese for his performance in the Mercer game, but with his flat shot it's not reasonable to expect him to be a consistent zone buster. We should never have Alex and Riley on the court at the same time, they more or less play the same role. While I appreciate Riley's effort and hustle, he looks over matched against quality teams and as long as he's not shooting he's not going to be able to help us. Furthermore, I don't ever want to see AJ and Collin in the game at the same time. It leaves us too small in the back court. It's fair to question whether AJ would be seeing as many minutes if his dad wasn't the coach. I would have tried putting both of our bigs, Donta and Dan, in the game together to match up with the large Texas front court. We should never have Sexton, Petty, and Dazon all sitting on the bench at the same time. It's simply baffling what we are hoping to accomplish with some of these lineups and the never-ending haphazard substitutions. This team is way too talented (and let's not forget, that's to Avery's credit) to be having these results. We have one year of the services of a lottery pick in Sexton, along with NBA caliber talent Petty, and at least 3 others with a legit chance of playing in the association (Dazon, Donta, Key). I feel like we aren't getting the most out of this opportunity because we can't or won't figure out a regular playing rotation. There was a good crowd for the late Friday night tip. The cavernous Legacy arena holds about 19,000, and I would estimate about 13,000 were there. Texas had a respectable showing of a couple hundred scattered throughout. The fans stayed behind the team and made some noise during our brief runs in the second half. People didn't start to leave until the final couple of minutes when it became obvious the game was a lost cause. We are now 0-3 in this Vulcan classic, and there are rumors we may be playing all of our home games here in the near future if plans to renovate Coleman Coliseum move forward. At some point, we need to start winning some big games at or near home. My seats were on the front row right next to Bama's tunnel. Avery gave me a dirty look when I yelled, "it's okay, just figure out a rotation and we'll be alright" as he walked off the court. You could see the disappointment on our players' faces as they walked off. I felt like they played hard, but the coaching staff did not put them in a position to succeed. It's noteworthy that Collin took time to take a picture with a young fan who was sitting in the floor seats, and bumped fists with several fans on his way off. He's super-competitive and you could tell he was down about the loss, but I think it speaks highly of his character that he would take the time to make that kid's day under those circumstances. I love Birmingham, but we need to figure some things out. I knew from past experience that trying to go out in Uptown before the game would be futile, and friends told me that every place had a 2+ hour wait. They only have one main entrance to the arena and require everyone to go through metal detectors, and there was no express lane for those of us without bags. It was a very inefficient process, and I barely made it to my seats in time for tipoff despite arriving at the arena before 7:30. I was pleasantly surprised that, unlike the last two years, they were selling alcohol. 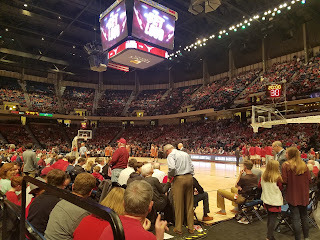 Given that the tickets were included in our season ticket package, and our athletic department staffed the event, I'm pretty sure we were in violation of SEC rules. Nevertheless, the overpriced crappy beers made this abomination slightly more watchable. Up next, another team from the state of Texas that's dealing with some injuries. The top ten ranked Texas A&M Aggies will visit Tuscaloosa to start conference play next Saturday at 5 pm. It will be televised on ESPN2. In the meantime, I wish everyone a Merry Christmas and Happy Holidays.